Cellucor C4 - Your New Pre-Workout Energy - Run.Lift.Move. Why is the unique sensation of carbonation so incredibly satisfying? Is it the feeling of bubbles popping on your tongue? Or, maybe it’s the sound of a newly cracked can? Whatever the reason, you just know you love it. Unfortunately, most carbonated beverages, like soda and energy drinks, come at a price…calories and sugar. Your average energy drink packs 110 calories and 27g sugar. And your average soda packs 138 calories and a whopping 33g sugar! For the fit and health conscious among us, the taste isn’t worth the excess calories or that sugar hangover you will inevitably get after downing a bottle or two. But what if you could enjoy the refreshing satisfaction of a delicious carbonated drink that is free of sugar and calories? And what if that drink actually helps you achieve your fitness goals and enhances your workout performance? What is C4 On the Go? C4® On the Go is more than an energy drink, it’s a pre-workout formulated to help you crush your fitness goals. 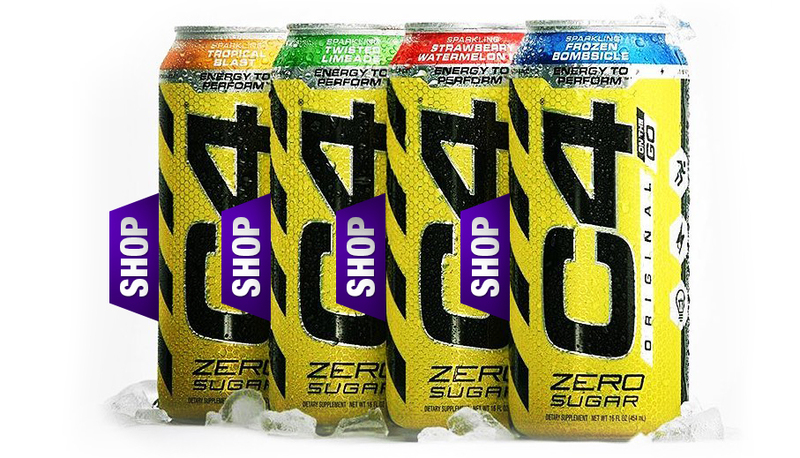 It has zero sugar and zero calories. Not to mention, it comes in incredible flavors like Frozen Bombsicle, Tropical Blast, Twisted Limeade and Strawberry Watermelon Ice. Thanks to the amino acid Beta-Alanine, which produces a harmless tingling sensation throughout the body that lets you know… IT’S GO TIME! Beta-Alanine is an amino acid that makes a compound in your body called carnosine, which supports muscular endurance by delaying the onset of fatigue. The result? Improved power and performance. Every serving of C4 On The Go includes the clinically studied CarnoSyn Beta-Alanine. CarnoSyn is manufactured under a stringent quality control process, and certified by national and international agencies to be safe and effective. C4 On the Go provides a powerful edge over your typical energy drink and coffee. With two all-star ingredients like Citrulline Malate and BetaPower Betaine, C4 On The Go gives you the energy to perform at another level. Citrulline Malate is used as a precursor to Arginine and nitric oxide production. Citrulline Malate may support an increase in nitric oxide levels–which improves the flow of nutrients, oxygen, and blood to the muscles for increased pumps and enhanced performance. BetaPower Natural Betaine is a high-purity anhydrous Betaine, derived from the molasses of sugar beets. Due to its chemical structure, it helps to maintain the cells electrolyte concentration and supports hydration. So, go ahead and put down those sugary sports drinks for your fix of electrolytes as pre-workout fuel. C4 On the Go is perfect for workout activities in the gym and beyond. With summer closing in, you may find your sweat sessions taking you places you never imagined. Just know, wherever you are, whatever your workout, tackle it with energy, focus, and efficiency… tackle it with C4 On The Go.